While espresso drinks are all the rage at the moment, one-third of the U.S. populace still prefer traditional coffee. A manual brewing machine that allows baristas to precisely control brewing time and water temperature will ensure the best final product. Traditional coffee machines intended for commercial use come in a wide array of sizes and styles. They also tend to be more affordable than high-tech espresso machines. 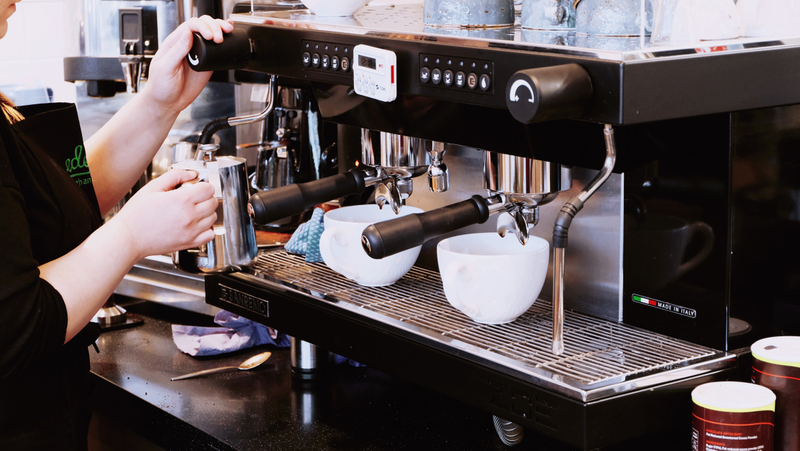 Often the most expensive purchase a coffee shop owner will make, an espresso machine should be chosen carefully to best meet the buyer's needs. An entry-level machine will typically feature a single boiler that requires a barista to brew and steam separately. While they're more expensive, dual-boiler espresso machines are a prudent investment since they allow baristas to brew and steam at the same time. Thoroughly cleaning coffee and espresso hardware on a daily basis is important for a number of reasons. For one thing, it's required by law if you're running a shop. Furthermore, failure to clean your gear will drastically alter the taste of your product. An all-purpose coffee equipment cleaner designed for metal surfaces is a must. A good milk cleaner for sanitizing espresso machines is just as important. Even the most discriminating coffee and espresso enthusiasts like to customize the taste and consistency of their beverages now and then. As such, offering a diverse menu of specialty additives is a no-brainer for coffee shop proprietors. Start by stocking up on a bevy of flavored syrups that customers can add to their brews. Common spices like cinnamon, ginger and cloves are also must-have cafe supplies. As important as all of these items are when it comes to starting a coffee shop, they're merely the tip of the iceberg. Waterfall Gourmet Beverages is a full-service coffee distributor that prides itself on providing coffee entrepreneurs with all the tools they need to thrive. Peruse our extensive collection of cafe supplies today to find the perfect merchandise for you.